Against a tough Real Salt Lake team on the road their second match of the season, Philadelphia Union had a shaky game defensively. Although they didn’t allow a single goal from open play, they committed far too many fouls in threatening areas and struggled with their marking on set pieces. In addition, Allen Chapman called a questionable penalty that turned a win into a draw. What stands out right away is that including the penalty, the Union committed seven fouls in their own defensive third. That’s far too many dangerous free kicks to be giving up, particularly when the opposing team’s specialist is a certain Javier Morales. In addition, Philadelphia’s marking in the box was lacking. They gave up a tremendous amount of chances on both open play crosses and free kicks, which contributed to the ten penalty area entries that were allowed. 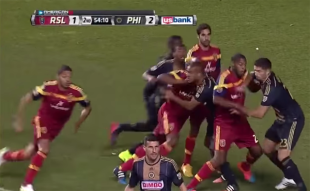 It’s tough to spot in real time, but Jamison Olave and Chris Schuler both act as screens to free up Olmes Garcia. They each impede the progress of Ethan White and Steven Vitoria while cutting off the path of Sheanon Williams, who was marking Garcia. It was a bit of a fluky moment, as Garcia’s touch deflected off of Olave and into the net, but the play worked just as intended, with a wide open header finding its way to the net. A similar screen can be seen on Javier Morales’s fifty-third minute free kick, which barely eluded Alvaro Saborio. Jamison Olave again set the screen, this time on Maurice Edu. Edu and Ethan White poorly communicated the switch, which forced Steven Vitoria into marking both his own man and Saborio. Dealing with screens on set pieces has been a key weakness with the Union over the last few seasons, and it definitely remains an issue that needs sorting out. 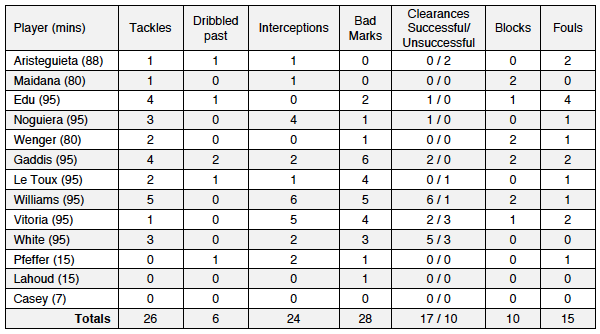 As for the individual defensive statistics, there was an appalling amount of bad marks all around. The majority of these came on free kicks, but a number of them also came during open play. Most of the poor marks during open play came down to a lack of communications on the respective flanks of both Sheanon Williams and Sebastien Le Toux on the right, along with Andrew Wenger and Ray Gaddis on the left. During play, both Wenger and Le Toux were easily sucked in on runs that were already well covered by either Edu or Noguiera, leaving their fullbacks outmanned on the flanks. And unless the ball was already in their vicinity, both wingers were slow to recover back to the wide areas. This narrow look of the Union’s defensive shape left them vulnerable to the crossfield diagonal balls that Morales and Kyle Beckerman happily supplied, time and time again. The poor marking of both Wenger and Le Toux was further worsened by Williams and Gaddis, who often stepped up to pressure when they had zonal marking responsibilities on the outside. Both fullbacks have been conditioned to play hard, aggressive defense, which they do as well as anyone in MLS, but they need to be more disciplined and know when to step or drop off. This should come with time, as communication improves with both their wingers and their center back partners. The biggest bright spot defensively was Vincent Nogueira, who showed that you don’t need to be a bruiser to be a solid defensive midfielder. He was all over the field with 3 tackles, 4 interceptions, and 1 clearance. These numbers are a testament to both his work rate and positional ability, which seem to improve on the defensive side every week. While he gave up three goals, Rais Mbolhi didn’t necessarily have a bad game in net. He was active in his box, as evidenced by his five interceptions and two clearances. And with the exception of the penalty, he saved 4 of the 6 shots on target. He certainly can’t be faulted for any of the goals that were scored on him. That being said, he struggled mightily with his rebound control, and had a number of punches or parries that ended up in dangerous spots in front of goal. Ideally, he should be either knocking balls out of bounds or sending them high, wide, and far from his eighteen yard box. Gaddis had the highest number of bad marks for the team. His performance certainly didn’t look like his best in this game and these numbers confirm that. I think he has had a rough start this year. The comment about Le Toux and Wenger following marks into the central channel when the DCMs were well positioned to pick them up is very useful. Thanks! “The play worked as intended..” You mean they meant to knee it off the cross, onto someone’s head, into the goal? Fluke goal. It was as intentional as their own goal. Agree that overall communication was poor and with improvement we’ll see overall D improve. Davis did mention that the final contact was indeed fluky. However, he is correct to point out that RSL did end up with 3 unmarked players attacking the ball behind the Union defense. Anyone of them could, and should, have finished the chance. And in the end it was a combination. The final strike was weird, but the tactics that led to all three getting in behind was smart and very intentional. Great analysis. Are these OPTA stats? Much appreciated. I actually compile these myself, although I’d say that it would most closely compare to the Classic Data Feeds that they offer. Is it too much to hope the club is paying someone to do this type of analysis for them? Or maybe they just come here instead?